Deflect-O vents are designed to look traditional, yet have a more attractive faceplate design than other floor vents. Our contemporary white floor registers are made out of a strong plastic and will simply drop in to your floor opening for installation. These Deflect-O vents will not rust, making them ideal to use in moist spaces such as kitchens or bathrooms. Use these white floor registers indoors or outdoors to control your air intake and outflow by sliding the adjustable damper to your preference. These Deflect-O vents are also sold in an attractive taupe finish for homes looking for a little color. Our white floor registers can be purchased in three sizes and ship straight to your door. 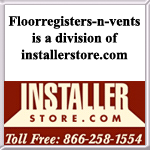 Tip: To order your white floor registers, measure your existing floor hole opening. The 2 x 12 Deflect-O vent will fit into a hole opening which measures 2" x 12". These white floor registers are also offered as a taupe colored Deflect-O vent which can be found listed with our other plastic floor registers. Buy these Deflect-O vents to replace worn out metal registers and free your space of unattractive rusting.